“Networking the Global Maritime Partnership” – Stephanie Hszieh, George Galdorisi, Terry McKearney, and Darren Sutton, via U.S. 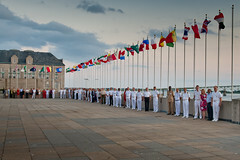 Naval War College | 2012 – Spring. This is a fascinating article that picks up on the concept first introduced by Chief of Naval Operations (later Chairman of the Joint Chiefs of Staff) Admiral Mike Mullen, wherein we no longer see the U.S. Navy as operating in a strategic vacuum, but as a component of a “Thousand Ship Navy,” a multinational maritime force of nations who share the same priorities and can therefore be melded into a single, unified force. I liked Mullen’s idea when he first introduced it six years ago, and I like it more now that the USN is fumbling its warship procurement efforts and other nations are expanding their naval forces (Look at the UK building two aircraft carriers as a part of a fleet renewal program as just one example.) Mullen may not have taken his ideas directly from Thomas P.M. Barnett‘s thinking about a multi-agency, multi-national response to global security challenges (as outlined in his seminal book The Pentagon’s New Map,) but the direction is the same. The U.S. may be sheriff, but it needs deputies to run the town. The article offers some detailed ideas about the challenges and opportunities in making it happen. This entry was posted in International Relations, National Security, Strategy. Bookmark the permalink.